Prussia/Germany won the Franco-Prussian War of 1870-71, and Germany became a new major power in Europe. There was a new patriotic feeling among Germans in Australia. The two Australian place names 'Sedan' (name of a battle in the Franco-Prussian War - won by the Prussian/German army) and 'Bismarck' (Imperial Chancellor in Germany - leading politician) originate from this time. More than anything else the German navy expansion aroused suspicion and mistrust in Australia as in England. There was a "German Fleet Association" (Deutscher Flottenverein) in Brisbane in 1899! People claimed that German agents were behind all the problems in the British Empire: uprisings in India, civil war in Persia, unrest in Egypt. The population of Australia in 1911 was 4,455,005. In Australia there were about 100,000 Germans in 1914. The First World War was a very difficult time for German-Australians. Before the war they were greatly respected. Between 1839 and 1914 German-Australians made a major contribution to Australia, particularly in South Australia (in 1900 almost 10% of the population of S.A. were German-Australians). Then Germany was the enemy in the war, and with the anti-German atmosphere in Australian society many British-Australians forgot this large contribution, and believed that the Germans in Australia fully supported the German Kaiser (emperor). German-Australians were proud of their heritage and culture but politically they were, with few exceptions, loyal to Australia. Most British Australians found it difficult to make this distinction. Many German Australians were in the Australian army and fought and died for Australia. 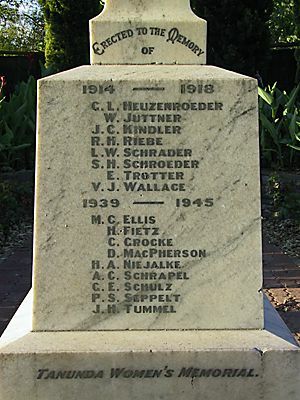 On the war memorial in the public gardens of Tanunda (Barossa Valley) are the names of eight soldiers who fell in the war. Six of them are German names. "There should be no Englishmen, Irishmen, nor Germans, but all South Australians." "The people didn't know what to do", my father answered when, as a child, I questioned him about the ill-treatment of a German in his town. "We hadn't had a war before this." Some German Australians were interned whose families had lived in Australia for three generations. Employment became difficult for German-Australians, and as a result some went into internment camps voluntarily. Some British Australians no longer wanted to work together with "Germans" and it became harder for German Australians to find work. Hermann Homburg, the Attorney General of South Australia, had to resign from his position. He was born in South Australia and had never been out of South Australia. The German Club House in Broken Hill, NSW, was attacked in January 1915. The building had been unoccupied since the outbreak of war. The mayor of Rainbow in Victoria's Mallee region had to resign because he was German Australian. This happened to mayors and councillors elsewhere also. "I might remark that we are at war with the German nation; we are not at war with German literature." In South Australia all 49 Lutheran schools were closed in 1917. After the winter break many of these were re-opened as state schools in the same buildings (rented by the Government from the congregations), with new teachers. This sudden change was traumatic for the youngest children particularly, as they couldn't understand why the Government would want to do it. From then on the students had no more German and Religion lessons. 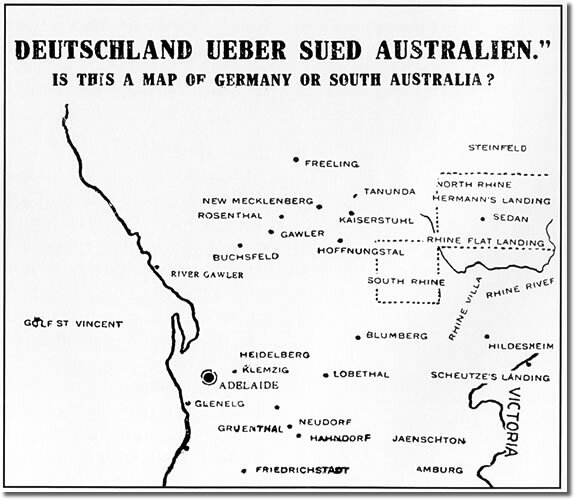 Many Australians believed all propaganda lies about German Australia. Some German Australians were put into internment camps simply because an Australian (perhaps even a business rival) had said that the German Australian had said something negative about England, even if he hadn't said it. The Teutonic brands which have been exported here by the enemy are taboo. Our lagers are equal if not better than their fancy brands. In 1916 the Upwey Progress Association (east of Melbourne) asked for a street lamp to be removed because it had the words "Made in Germany" on it. St Kilda Football Club changed its colours in 1915 from red-white-black (same colours as the German imperial flag - see the Flags of the World website) to the black-gold-red of Belgium's flag. St. Kilda reverted to the original colours later. Matilda Rockstroh, who worked in the post office within the St Kilda railway station in Melbourne, Australian-born and in the public service for 37 years, with no evidence of any disloyalty, was moved out of her position because of her background. She was no longer allowed to have contact with customers. Edmund Resch, the founder of Resch's Beer in Sydney, was interned. He had lived in Australia for 50 years. Governments in Australia changed very many German place names, despite the fact that these German names derived from "pioneers". In South Australia the government changed 69 names of places and geographic features. See a List of German place names in South Australia. It is interesting to note that Adelaide, the name of the capital of South Australia, was originally German. Read about the name Adelheid. The government in South Australia did not change this place name of German origin. 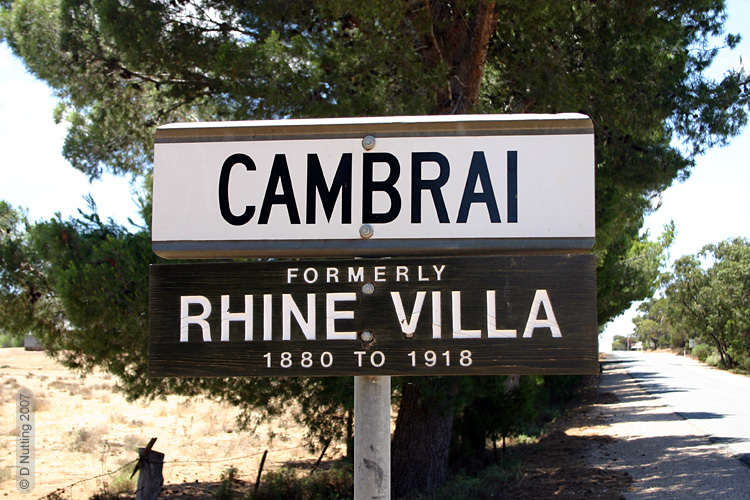 Place name sign in Cambrai, a village located east of Eden Valley and 9 km south of Sedan in South Australia. The original name of the place was Rhine Villa. The new name Cambrai referred to a battle in France in 1917 during the First World War. Many German Australians changed their name. Paul Schubert, teacher at Sturt Primary School in Adelaide, had to change his name in order to keep his job. He became Paul Stuart in 1916. Even the British royal family needed to change its name. Through the marriage of Queen Victoria (1819-1901) to a German prince in 1840 the British royal family had received a German surname. In 1917 King George V. changed the family name. No longer Saxe-Coburg-Gotha; the new family name was Windsor. Victoria's cousin changed his family name from Battenberg to Mountbatten. Mountbatten sounded more English. These prejudices did not exist only in Australia. In the USA 'sauerkraut' received the new name 'liberty cabbage' and 'hamburgers' received the new name 'salisbury steaks' (named after the doctor Dr. J.H. Salisbury: he recommended eating a burger three times daily). Sometimes these new names did not last. An amendment to the "Aliens Restriction Order" on 28th July 1915 prohibited enemy aliens and naturalised subjects from changing their name or their business name. During the war the Australian Government tried to introduce conscription. Australians rejected conscription in the first Conscription Referendum in October 1916. "Patriots" blamed the failure of this referendum on Roman Catholics and German Australians. These "patriots" were sure that German-Australians had voted against conscription and that the large numbers of German-Australians must have affected the vote. In 1917 Prime Minister Billy Hughes took away from German Australians the right to vote, however, the second Conscription Referendum held in December 1917 was also defeated. This denial of the right to vote, this sign of doubt at their loyalty, angered men fighting in the AIF (Australian Imperial Force) whose parents were German-Australians. Read one soldier's complaint about this. In The Australian People and the Great War, Michael McKernan wrote in 1984 that up until 1914 the German-Australians "had been admired and respected. But the Australians, so heavily committed to the war emotionally, needed to manufacture a war close at hand lest their knitting and their fund-raising be their only real war experience. The German-Australians became the scapegoats for Australia's fanatical, innocent embrace of war." Bennett, Robin. Public Attitudes and Official Policy towards Germans in Queensland in World War 1. Honours Thesis, University of Queensland 1970. Harmstorf, Ian. Insights into South Australian History, vol. 2, South Australias German History and Heritage. Historical Society of South Australia Inc. 1994. McKernan, Michael. "Manufacturing the war: 'enemy subjects' in Australia". Chapter 7 in The Australian People and the Great War. Sydney: Collins, 1984. Tampke, Jürgen and Doxford, Colin. Australia, Willkommen. New South Wales University Press 1990. Voigt, Johannes H. Australia-Germany. Two Hundred Years of Contacts, Relations and Connections. Inter Nationes. Bonn 1987.